Crave Beauty Academy is honored and excited to announce the official nomination Crave Cosmetology Student Beki Keraly recently received. Beki is 1 of 5 Cosmetology students throughout North America that has been nominated as Student Stylist of the Year with NAHA. NAHA (North American Hairstyling Awards) are the most prestigious awards a beauty professional can receive in their lifetime. So, you can imagine how receiving a nomination as a student would make one feel. A career in the beauty industry was not what Beki originally had in mind. She spent years in local theatrical productions and assisted with wig styling. At the time, she says she didn’t really care for styling wigs. Her sister-in-law and best friend recognized her talent, however. They urged her to think of a career in the beauty industry, but Beki just couldn’t see herself there. She continued schooling at Wichita State University and spent even more time in theatre. Her sister-in-law and best friend urged her yet again to think about beauty school. She was at a point in her young life where she knew she needed to way some pros and cons about pursuing a profession in theatre. That’s when she decided to go ahead and ponder the idea of beauty school. A very close friend of hers suggested she check out Crave Beauty Academy. Her friend had gone through the Esthetics program with Crave, but prior to, had gone through another local school’s Cosmetology program. Her friend described Crave as being a place where the educators allowed students to run with their creativeness. That was what did it for Beki, plus the friendly, family atmosphere was a bonus. It wasn’t until Beki took one of her first hair design classes at Crave Beauty Academy taught by Scarlett Davis, that she began to truly understand design and styling principles. She began experimenting with ideas and that’s when she realized how much she actually loved it. Beki really enjoys coloring hair as well, but says styling is definitely what she loves most. And clearly is shows! Chelsea Greene, an alumni of Xenon International Academy (Crave Beauty Academy) noticed Beki’s incredible talent, and urged her to look into entering the Student category of the North American Hairstyling Awards. Since Beki never turns an opportunity down, she decided to go for it—what would be the worst that could happen, right? Ideas started popping into her head, and she decided to run with a zodiac theme. 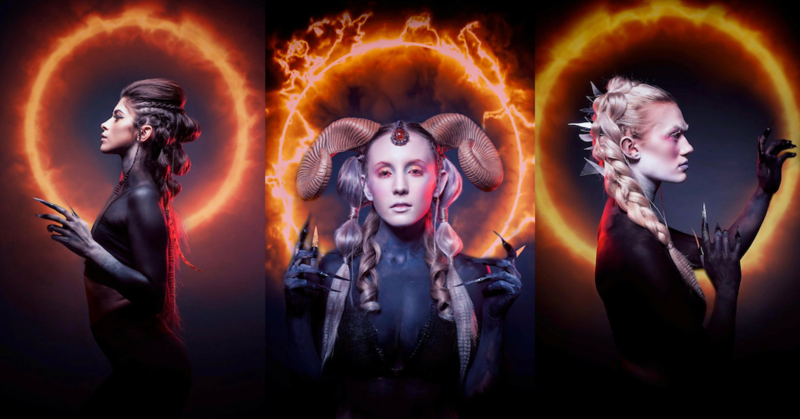 She was to submit 3 images in a cohesive collection, so she wanted to go with the fire signs. As she brainstormed and started styling her first model, she realized she would have to improvise a bit. As you look at her collection, you’ll still clearly see incredible images of fire throughout. Spending roughly 4 hours of styling and shooting per model–yes you read that correct–it all came together. The image of the woman in the middle is depicted as a “Leader” while the other two women are her “followers” in what Beki calls “Entities of Power”. The women have a sort-of witchy, demonic, non-human state of existence—people you may fear, however respect. With painted bodies and elongated nails, looking at this collection as a whole, we believe Beki’s vision is very obviously translated. If you take a look on her social media, you may even be able to find an additional 2 Entities of Power. Once her photographer, Robert Thompson, began sharing the original 3 images that were submitted to NAHA, friends and on-lookers began asking for more. They got together and created 3 more images, but went with only 2 to add to the final collection of 5 Entities of Power. When Beki submitted her collection, she really made sure not to get her hopes up for a nomination. She wanted to enter for the experience and to say she did it. If there’s one thing Beki doesn’t say, it’s “no” to an opportunity to practice her craft. Beki has volunteered her time, passion, and talent to so many events, including the annual Tallgrass Film Festival held every year in Wichita. That’s where she rubbed elbows with film industry directors, actors, actresses, and hair and makeup artists. Her goal is to eventually move to Albuquerque where Netflix has recently opened a new studio, or to move to LA. Either way, she wants to dedicate her career to doing hair and makeup for films. 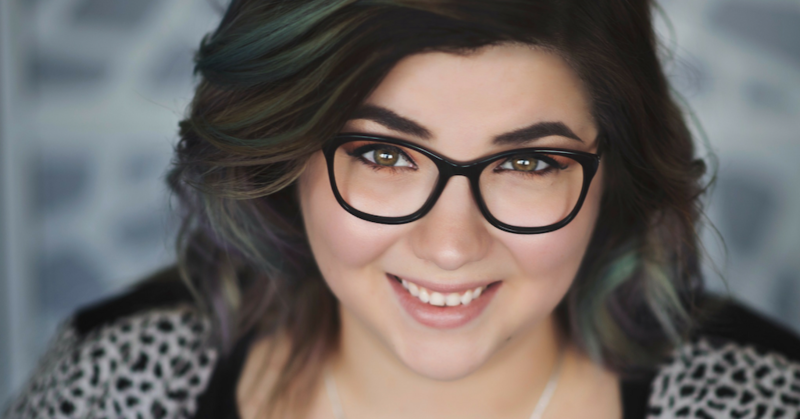 While working on projects with Wichita Photography Kacey Meineke, Beki was introduced to an LA-based, but Wichita native, famous gamer. She was complimented by her, having been told she has more passion and talent of the Hollywood stylists she’s personally worked with. And better yet, was told that if she does choose LA as her home in the future, to give her a call, she has people for her to meet! The news of her NAHA nomination came as a complete shock, believe it or not. Beki was having her nails done at the time of the announcement. While tears were not shed because that’s not Beki’s style, much excitement was shared at that nail appointment. She immediately started texting her mom, her boyfriend, and others and each and every one of them celebrated her. The nomination was well deserved, especially considering all the time and effort put into the collection. NAHA has extremely specific rules and regulations when it comes to the photography of the images. The design of the hair had to be just right. No editing, other than removing a stray hair here and there, is to be done to the models. That means photographers are not to expand or transform the hair in any way digitally. If on January 26th, 2019, Beki takes home the award for Student Stylist of the Year, this will definitely mean big things are in store for her. She will be mingling and networking with the industry’s elite. Networking and building professional relationships locally has been what has gotten Beki so far. Making connections with top beauty professionals will get her closer to her goal of eventually working on film sets.